Merry Christmas, Everyone! I wish for all of you to have a merry and bright Christmas filled with love, joy and happiness!!! Thank you for stopping my blog and always being so kind with your comments. I am very grateful for all the blessings in my life including all of you!! I'll be on blog vacation until January. A few of my family from Hawaii will be here to visit us in California so I will be spending time with them. We'll also be spending time with them in Disneyland for New Years. . . I may pop in and blog our pictures with them if I can find the time. Again, Merry Christmas my friends!! MIA - Card Inspired On Blog Vacation!! Hi Everyone! You're asking, "where are you, Maria"? LOL! 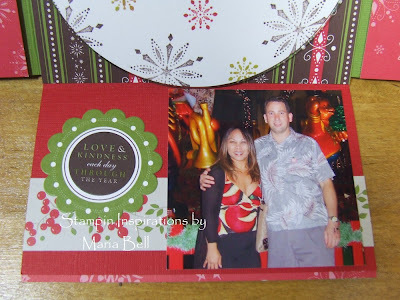 Actually, I've been MIA on this end of the world because I've been working on primarily rubber stamping projects and no "scrappy cards or scrapbooking projects" so I've been posting my work on my Stampin Inspirations blog site. Stop by and see what I've been doing there!! I'll be back on this side in January. 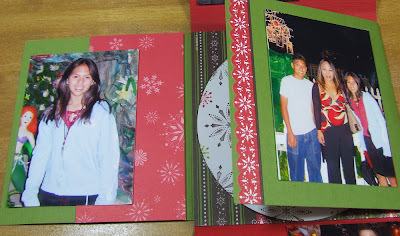 I really want to get back to doing my scrappy projects and especially, creating scrapbook layouts and mini albums. I have a lot of photos to work with. Hope you all have a beautiful Christmas and a great start with the New Year!! I added the extra entries for posting my candy on your blog which added the total entries to 147. . .through Random.org. . .the random number chosen was 144. Number 144 on the list was Stephenie!! 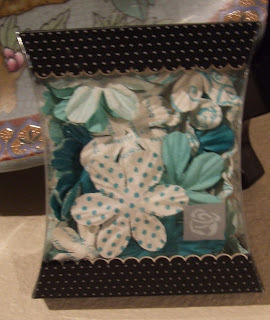 Blog Candy winner: Congratulations Stephenie of "Stephie's Space"
Please email me you snail mail!!! Hi Everyone! Whoohoo! I created a card for Sankari and Brooke's Cinema Saturday Creative Challenge #9 - The Sound of Music!! I've been wanting to play since they started their challenge blog! Well, I finally stuck to the plan and created this card. Sankari will be proud of me! LOL! 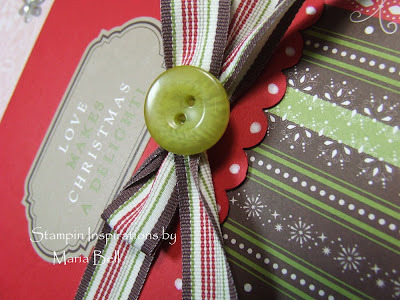 I posted my card on this blog site rather on Stampin Inspirations because there is absolutely no rubber stamping on this card. I had computer generated the sentiment and the dresses are scrapbook embellishments by Jolee's by You. This week's challenge is to create a card based on the movie "The Sound of Music". Oooh, one of my favorite movies. I don't like to watch a movie more than once but "The Sound of Music" is an exception. I think I've watched this movie at least once every year since I first saw it as a child. Really! I guess because well, it's one of those movies that is shown on TV every year and we also have the DVD. Although I love all the songs in the movie, one of my favorite is "So Long, Farewell" so my sentiment on my card is based on that song. It has sad undertone to the song but there's a sense of innocence to it from a child's point of view. I also love the song "Edelweiss". . .both sad but beautiful songs. 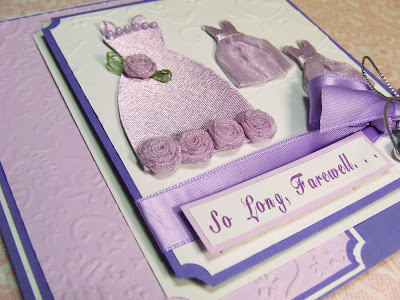 I created this card with the dresses because I really loved the pretty dresses that Maria and the girls wore and the dresses on my card reminded me of them. I wanted the card to be somewhat elegant so I kept the design colors at a minimal. I would have preferred a different colored dress or color combo but these dress embellishments were the only ones I had. Anyway. . .be sure to stop by and check out the challenges! They are really fun!! Hi Everyone!! Gosh, I haven't posted on this blog for a while now. 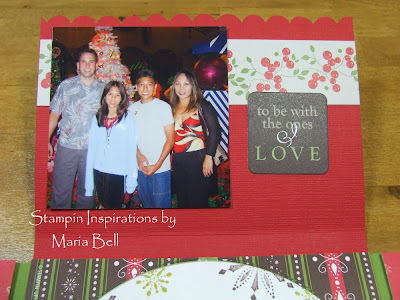 I've been so busy with life and I've only had time to post on my Stampin Inspirations blog site. I hope after the holidays, I'll find more time to create "scrappy" projects. 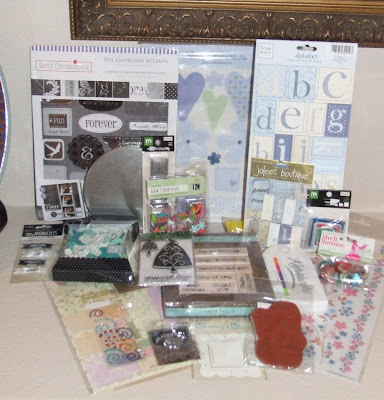 This site has no "rubber stamping" cards and projects and it's primarily where I post scrapbook projects, scrappy cards, and other non-stamping related projects. This is the case opened up and it's a mini album/CD case. 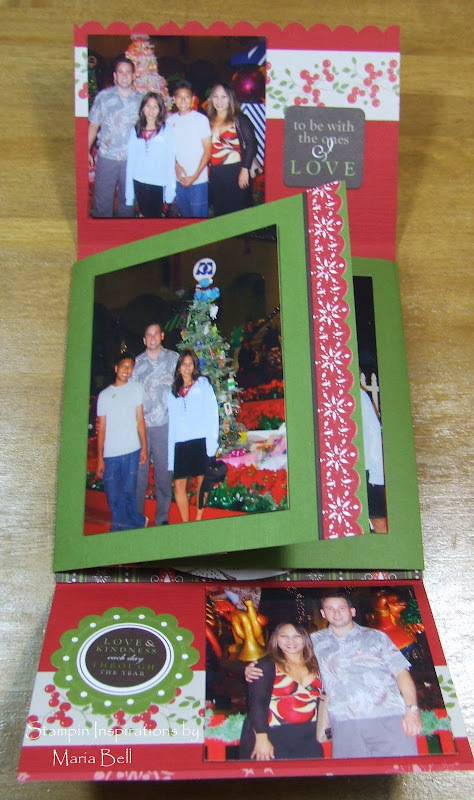 It's a fun way to share your photos with family. 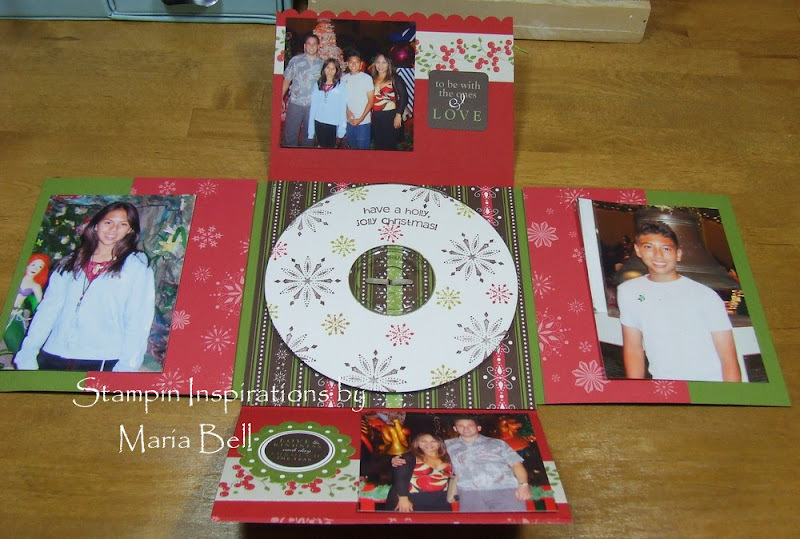 The cardstock, papers, and embellishments for this project are all from the "I Wish - Simply Scrappin' Kit' . 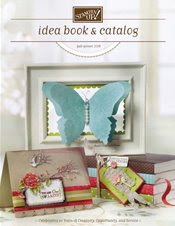 This kit comes with everything you need to create several scrapbook pages, mini albums, and cards. I really love the design of the designer paper in this kit. The size of the CD case is 5 x 5". I decided to keep the design simple because I wanted to finish this project quickly. You can create this project in an hour because all the stickers are already cut out and ready to stick on your project. The color combo for this project is "Real Red", "Old Olive" and "Chocolate Chip". Such a pretty color combo. The picture to the left is of me and my husband. As you can see, there are a lot of pages to add lots of pictures. Anyway, if you decide to try out this project, let me know what you think!! Hope you like it!! 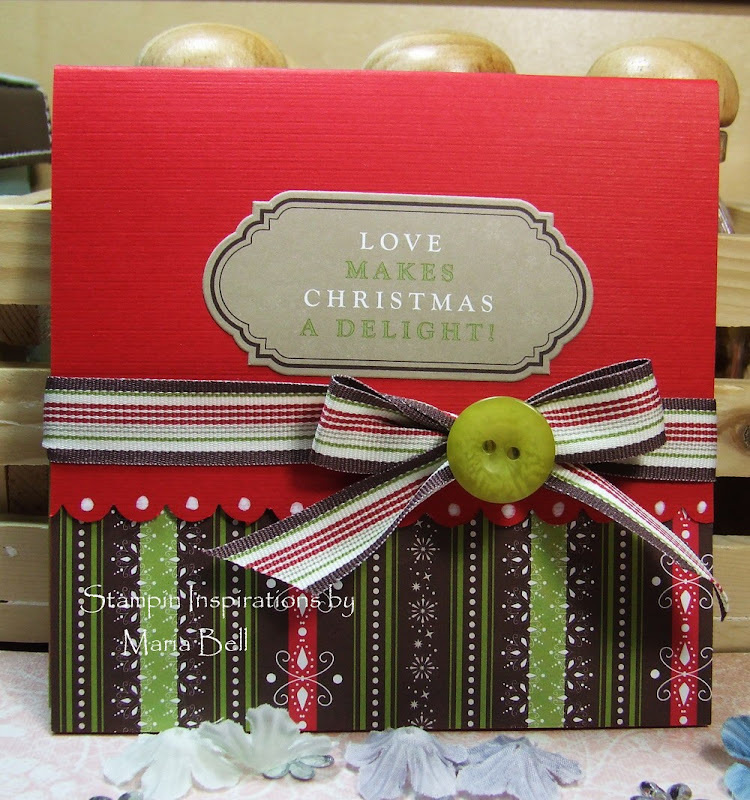 Papers: I Wish Simply Scrappin Kit, Textured Real Red, Old Olive cardstock from the kit. Blog 2nd Anniversary and Blog Candy!! LOL! I'm posting this blog candy on all of my blogs. Only one entry will apply. . .you may choose any of my blog to comment but only one entry will apply for all blogs. Hey Everyone!!! Friday, December 5th is my Blog 2nd Anniversary! I was going to wait until the 5th to announce the blog candy but I want to get the package out before the Christmas rush kicks in. The blog candy will run from from December 3rd (today) and will end on Wednesday, December 10th, 12:00 midnight PST. The blog candy is open to US and Canadian residents only. I'm sorry for the International readers, I hate doing customs at the post-office. It's painful! It's been such a wonderful 2 years of crafting and blogging and especially meeting such wonderful people who I would never have met if it wasn't for this fabulous world of blogging. Thank you for inspiring me, entertaining me, and just being kind and encouraging. I, especially, appreciate my regular blog readers who always comment with such kind words. . .you brighten my day when ever I receive your comments or emails!! Whenever I visit a blog, I ALWAYS read what the blogger writes. That is one reason why I take a long time to make my rounds as far as commenting your blogs. I actually read what you write and I like to comment on what your talk about. I not only enjoy the beautiful work that you post on your blogs, but I especially enjoy reading what you have to say. So here's the deal. . .one entry per person. Comment on this post by linking a blog that you regularly like to READ. . .not because of their beautiful art work but because you like what they write aside from the subject of card making, scrapbooking, or any art work. Tell me why you like to read this person's blog. 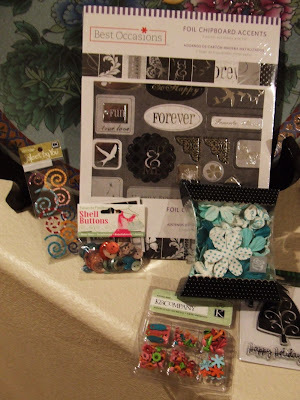 The blog don't have to be stamping, cardmaking, scrapbooking related. . .any blog applies. I will, in time, follow those links and read them myself as well. Please leave a comment on this blog. . .do not email me because I cannot keep track of my emails! LOL!! Everyday until the blog candy ends next Wednesday. . .I'll add a new item in addition to what is pictured and listed below. This is just the start of the prizes!! Whoohoo!! Link this blog candy on your blog and you'll receive an extra entry. Please let me know on your comment that you'll be linking this blog candy on your blog. Thanks!! One winner will be RANDOMLY chosen and announced on Thursday, December 11th. If the winner do not respond within 48 hours, I will choose a new winner because I want to get the package mailed out as soon as possible. Be sure to check back daily to see what else I've added to the prize. Good luck!! December 4th - I added a container full of Prima Flowers! Here are the additional items I promised to add to the blog candy!! Whoohoo!! I'm Back from my Trip!! Hey, Everyone!! I'm back from my trip to Yosemite! Oh, gosh I had so much fun!! I cannot begin to tell you how beautiful it was. If you've never visited Yosemite, I do highly recommend it. There's a lot of things to do and it's like being somewhere so unlike the concrete world we live in. Nature is so beautiful!! Anyway, I'm trying my darn hardest to get back in the swing of things. I'm glad you're still around. I'll post something here soon!! Hope you all had a fun Thanksgiving!! !